Selling a home quickly and for top dollar requires a professional who has experience, knows the market and understands what current buyers are looking for. If you are serious about selling your home you need an agent who goes above and beyond to get you where you want to be. SOLD! Symple Shortcodes is the best Free shortcodes plugin out there 1L. Symple Shortcodes is the best Free shortcodes plugin out there 1R. No two homes are alike. I categorize homes based on current market conditions. Ask me about my Unique – Compete – Repeat marketing method. Pricing your home appropriately for the market is paramount. Review page 7 of my seller packet to see how time on the market effects selling prices. My Homeowner Lifestyle Questionnaire is my own unique concept tool for marketing and selling homes. Let’s speak in person about this. It’s super top secret! Retina Ready Images are photos take with a very high DPI (dots per inch) or pixels per inch in this matter. I only use high resolution images for the web and print marketing so your home always looks its best. 93% of buyers and 100% of buyers agents use the internet to find real estate to buy. Maximizing a property’s exposure through this medium is extremely important. I make sure your property shows up in search engines, social networks, and directories. That’s just the SEO part. Syndication and my Share Network are below. As I mentioned I cover the web thoroughly when marketing properties. I also create a dedicated property page on Facebook. Let’s face it Facebook is a MONSTER. There is no better way to reach people locally. A dedicated web page on the internet will be seen by very few people but with my Share Network techniques your home will be everywhere. All listing material will have full property details including stats, images and a custom marketing description to represent the property accurately and to the current market. Your property will be listed in the MLS (Multiple Listing Service) as well as the Keller Williams world wide site. Your listing will then syndicated out to 1000’s of other websites that will show your property for sale. See my syndication page in my seller packet for more details. It’s advertising on steroids! Open Houses will be scheduled to showcase the home to potential buyers and agents. I will set up a schedule with you so you know well in advance which days we will be having an open so the home can be in tip top condition! Of course there is a yard sign. I list this last because it takes me the least amount of effort to make this happen. Is it important? Yes! Many agents list this in their top 5 things they do to market a home. That’s not how I roll! 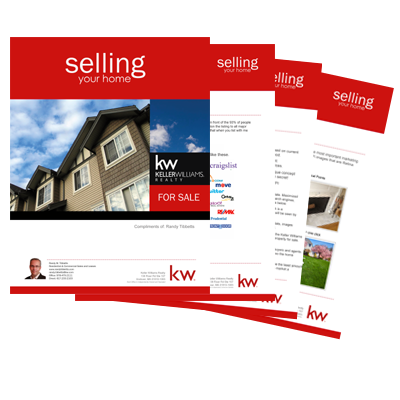 Take a look at my Sellers Brochure. It’s FREE with no obligation.